In 1946 the Canadian Military, along with British and US observers and advisors, set out to test the latest technological advances in extreme winter weather vehicles and equipment. Twelve tracked vehicles were to travel from Churchill, Manitoba north through Arviat, Baker Lake, Cambridge Bay, Kugluktuk in Nunavut, then south across Great Bear Lake (map), up the Mackenzie and Liard Rivers through Fort Nelson, British Columbia and on to Edmonton, Alberta, a total distance of 3200 miles! This was a major undertaking and the Royal Canadian Air Force had to put together a fleet of airplanes and stockpiled food, fuel and spare parts at air bases in Churchill, Manitoba, Baker Lake, Nunavut, Norman Wells, Fort Smith in the NWT and Fort Nelson in British Columbia. The convoy of tracked vehicles left Churchill on February 15th, 1946 travelling on the relatively smooth sea ice to Arviat. The next leg of the journey, cross-country to Baker Lake, proved much more difficult. The route, chosen by aircraft flying overhead, was strewn with concealed boulders that did considerable damage to the vehicles. 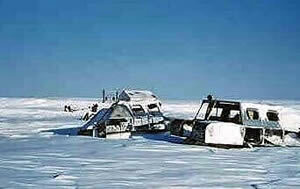 It took until March 15th for the convoy to reach Cambridge Bay, their furthest north point of travel. By the time the expedition reached Great Bear Lake it was April and large pressure cracks had opened in the lake ice and it was into one of these that one of their vehicles fell. A bulldozer from the nearby Port Radium had to be called to assist but unfortunately it too went through the ice, killing its operator. Spring conditions made travel across the land precarious especially in the Mackenzie valley on a tractor road that had been built a few years earlier for the Canol Project. With temperatures above freezing this winter tractor road quickly deteriorated into one very long mud hole where every mile gained was a battle. The trail took the convoy up the Mackenzie and Liard Rivers past Fort Nelson and on to Dawson Creek. By then the vehicles were in such poor condition they had to be loaded onto railway cars and freighted down to Edmonton. In spite of all the problems encountered Operation Muskox was declared a success and on May 6th, 1946 a victory parade was held along Edmonton’s Jasper Avenue. Old "Exercise Musk-ox" vehicles, Baker Lake settlement, 1957.